Let’s go for a stroll and see what we may encounter. Shall we? Tile roofs are a rarity in Maine. That alone is usually enough to catch the eye of the stroller. 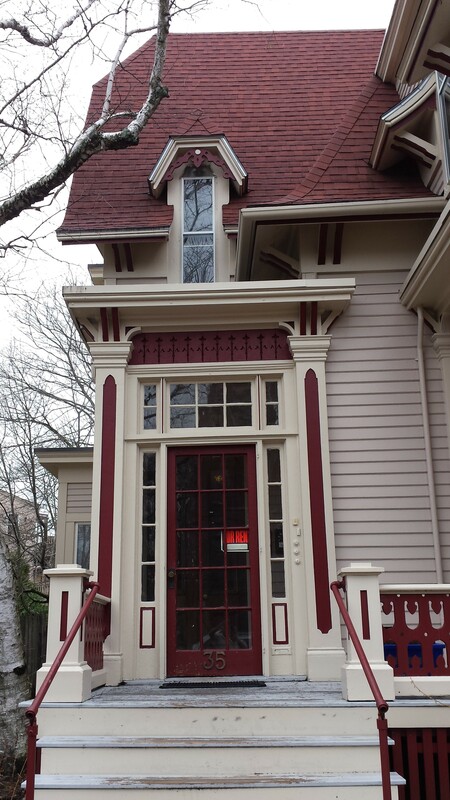 Our subject this time has the added benefit of being from the cities best known architect, John Calvin Stevens. Thomas Street traces a bent 2 block path from Spring to Pine Streets over it’s 2 block length. 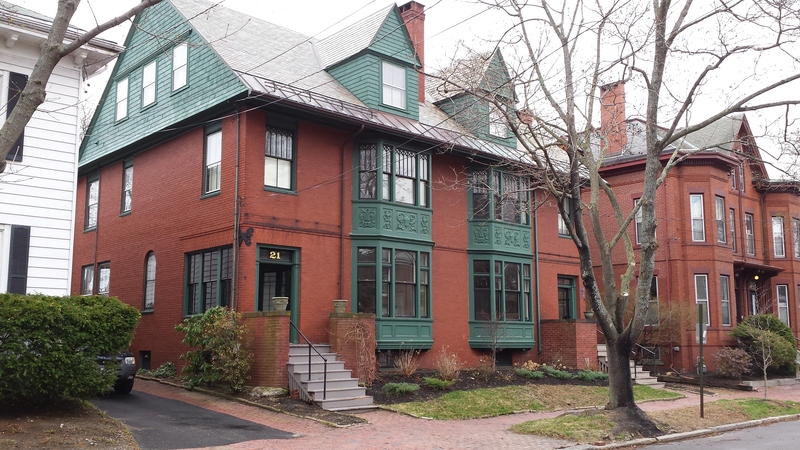 On the Spring street, we are welcomed with a transitional, hybrid Colonial Revival-Arts & Crafts home in brick. 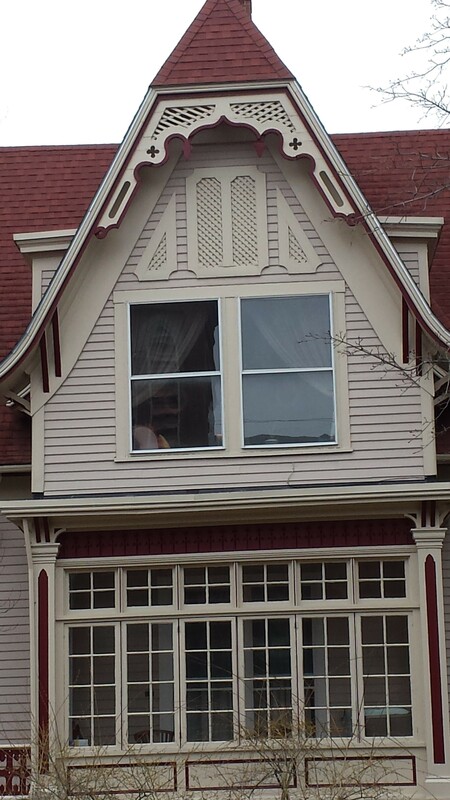 Showing a Queen Anne style turret, brownstone lintels and dark trim, it also presents us with a wonderfully arched entry and simple trim details of the newer, less ornamental style. 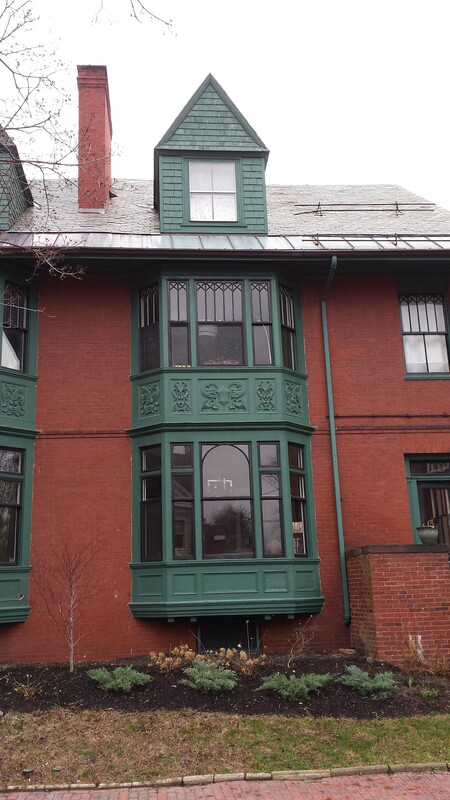 The thin muntins and large panes in the windows show that Stevens was looking at the new Arts & Crafts style that was starting to gain popularity in the country. 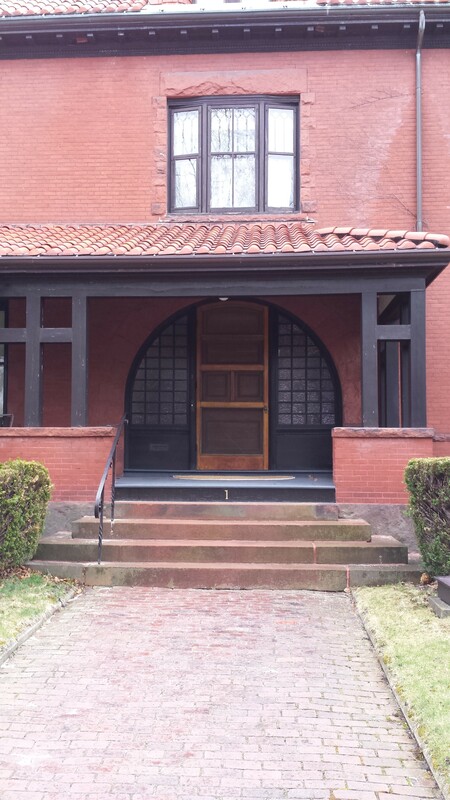 The band of windows and simple post work of the porch add to the ‘newness’of a more traditional form that is suggested by the use of tile roofing. Here is a photo of the house from the 1924 tax rolls. It was owned by a Harry Butler at the time. Mr Butler was a director of the Portland Rail Road Line. The building was valued at $9800 and the land was valued at $4100. PS 5.25.15. I have located a pen and ink of the Butler house by Stevens. From Maine Historical Society. Next up is 33 Thomas Street. A lovely duplex in the Stick style. Nicely maintained with a great palette of colors, it has several of the features that define the stick style such as the detailed rake boards on the projecting bay, the sloping ‘roof’ over the window on the right and the brackets at the eaves. 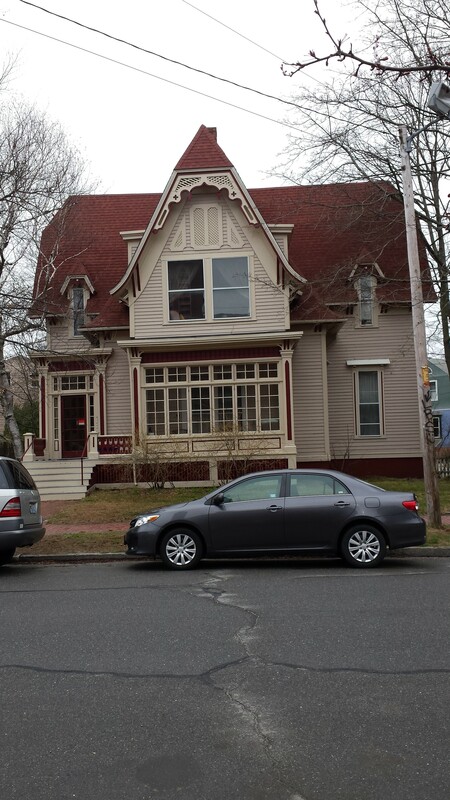 Your author feels the use of architectural shingles is not in keeping with the style. 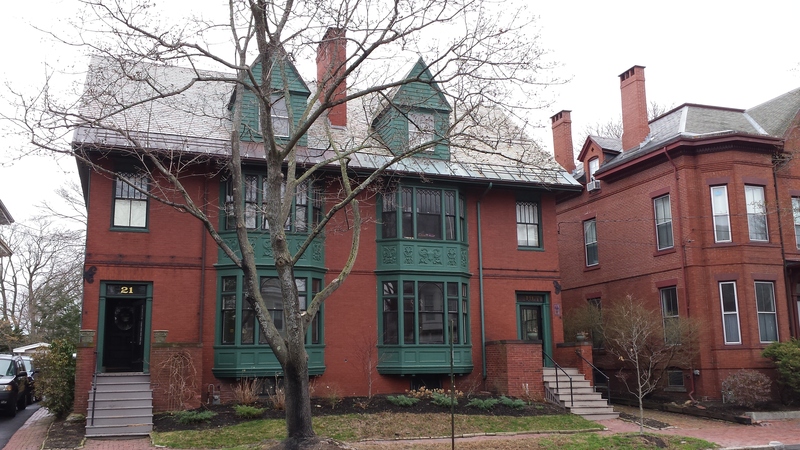 A simple 3 tab would be preferred as it is more in line with the original roofing. From the 1924 tax records, it appears it was always a 2 unit structure. 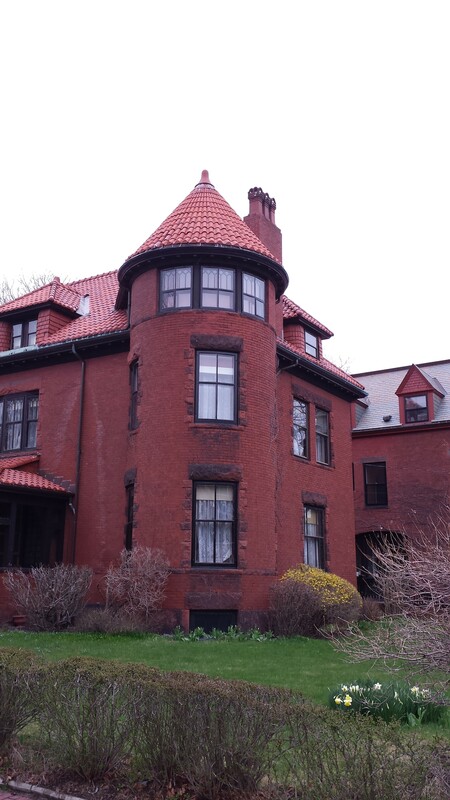 In 1924 it was listed as owned by Elizabeth F Flaherty. Valuation was $4850 for the structure and $3150 for the land. Our last building for this visit is the double house at 19 and 21 Thomas Street. 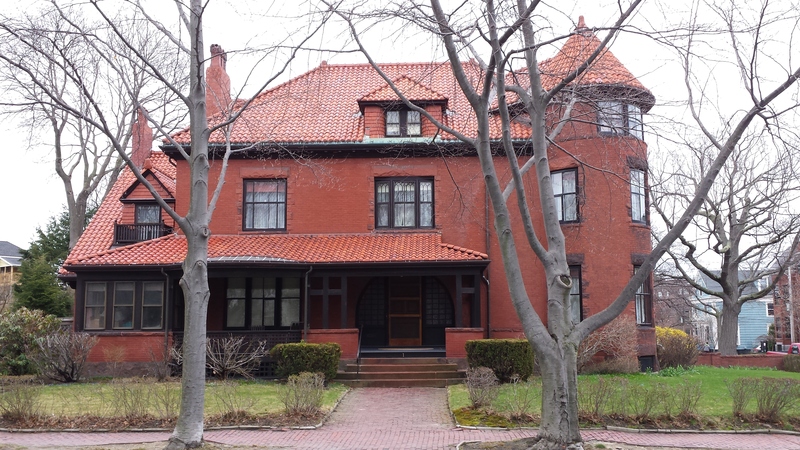 Known as the James M. Waugh Double House. 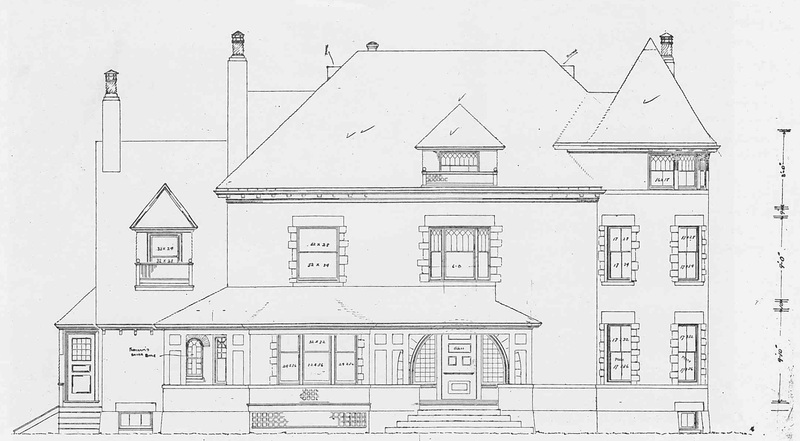 Another John Calvin Stevens design, this form was regularly utilized, with some variation, by the architect for buildings all over the peninsula. A brick structure in the Colonial Revival style, 19_21 Thomas displays Steven’s ability to avoid excess detail whilst allowing for some flair in the handling of the second story bays and the iron plates at the corners. A strong belt course acts to break the surface and reduce the feeling of mass. Well maintained, the house still exudes a confidence without being over the top. The 1924 tax records list the owners as Adelaide L. Frost in 19 and Sanford Corey in 21. Combined values were $9230 for the building and $3437 for the land.